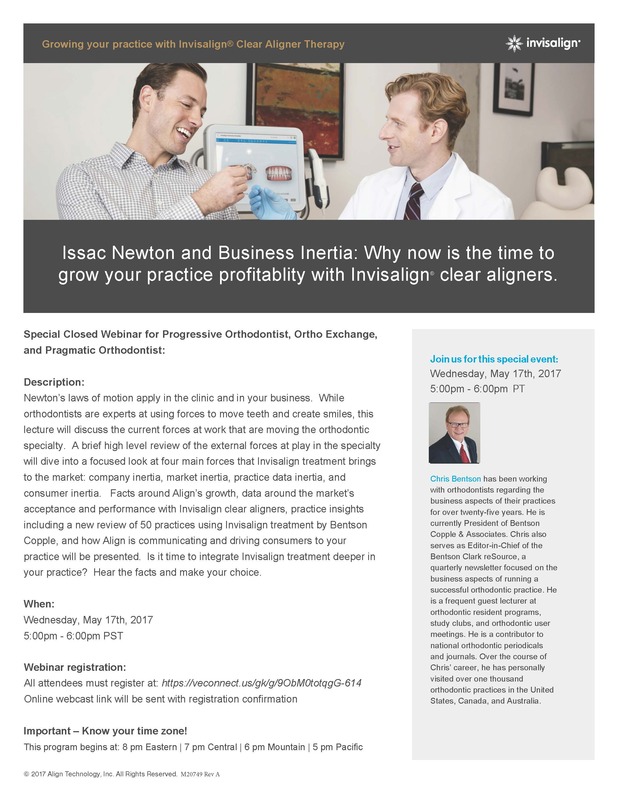 Exclusive Webinar Opportunity: One-Hour Webinar for Progressive Orthodontist, Ortho Exchange & Pragmatic Orthodontist members ONLY. Newton's laws of motion apply in the clinic and in your business. While orthodontists are experts at using forces to move teeth and create smiles, this lecture will discuss the current forces at work that are moving the orthodontic specialty. A brief high-level review of the external forces at play in the specialty will dive into a focused look at four main forces that Invisalign treatment brings to the market: company inertia, market inertia, practice data inertia, and consumer inertia. Facts around Align's growth, data around the market's acceptance and performance with Invisalign clear aligners, practice insights including a new review of 50 practices using Invisalign treatment by Bentson Copple, and how Align is communicating and driving consumers to your practice will be presented. Is it time to integrate Invisalign treatment deeper in your practice? Hear the facts and make your choice.